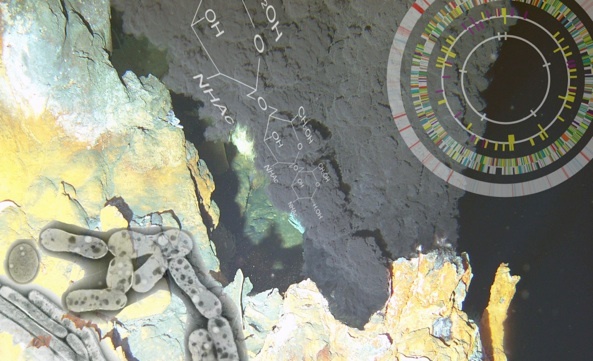 Rich microbial ecosystems exist in deep-sea and oceanic sediments, and even in rock deep inside Earth's crust, where not long ago it was thought that life could not exist. We have special interests in the ecophysiology and evolution of 'earth-eating' microorganisms inhabiting various extreme marine environments such as deep-sea hydrothermal fields, since it can be a useful model to understand the marine biosphere comprehensively. Our projects include: 1) Microbial genomics, transcriptomics, and glycomics to better understand how marine microbes respond to their surrounding environments and how they interact with other organisms, and 2) Ecophysiological and population genetic analysis of marine extremophiles.